Music and Sport Fanatic with a great interest in hearing the opinion of all readers. A local restaurant that provides quality food, cheap prices and great customer service can be a huge hassle to find. Rising prices, increase in the number of fast food outlets and just a general lack of quality has seen the standard of eating out for dinner drop dramatically. Rashay's in Liverpool is a diamond in the rough that provides the customer with all they could want, without having to sacrifice any of what should be the necessities of dining. Following the welcomes of the friendly staff await a lovely table set and ready for you to order. The menu contains one of the largest ranges of food I have seen at a restaurant in my life, with anything from pizza to seafood available for your purchase and eager consumption. Once you have pushed past the difficulty you have in making a decision of your meals, you will become completely lost in the atmosphere Rashay's has created. New mixed in with classic creates a blend that will have any customer happy, all this done with televisions and music to keep everyone entertained. The meals are quite filling, I struggled to finish four slices of my Chilli Prawn Feta Pizza and it seemed everyone I had the pleasure to dine with on that fine evening also found the meals to be of high quality and high quantity. What is really great about this is that Rashay's will provide you with boxes and such to take your food home, so that you don't wake up the next morning feeling like you have wasted your hard earned income because you only ate half the meal. A side note for all the chocolate lovers, the mud cake is absolutely breathtaking and the Mars Cheesecake is to die for. Check out the desert menu, you will not be disappointed. Contact the Restaurant directly on 13000 13000 to make a booking, which I highly recommend you doing as this place can fill up quicker then a kebab shop on a Saturday night. Overall I have got to say that the experience I had at Rashay's was one of the best I have had in a long while. 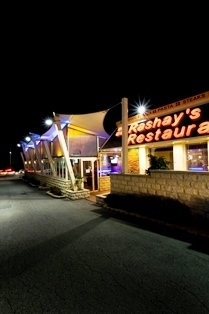 Skip your lunch, save some room and head to Rashay's for one of the best meals you have ever had in your life, you will not regret it.